Your visit to Vietnam, Lao & Cambodia. This multi country tour offers everyone oppotunities to discover local culture of Indochina while enjoy stunning lanscapes found around every corner. Catch up sights & sounds of the hustle city, sightseeing Saigon’s landmarks, take a visit to incredible Cuchi tunnel. Boat cruise on mighty Mekong River, visit orchard gardens, farms, local homes & local cottage industries, cycle through lush countryside and visit floating market. Inhale fresh air from the top of Hai Van Pass, discover the Imperial Citadel & Royal relics. Enjoy Hanoi’s food and the cooking class, visit Temple of Literature, museums, walk around the Old Quarter and enjoy water puppet show. Spectacular country & mountain landscapes, experience the local life in Mai Chau valley, home stay in house on stilts. Visit the Royal Palace, the Silver Pagoda & some other sights. Stroll around busy streets, enjoy the nightlife on bank of Mekong River, shopping around before taking your departure flight. Upon arrival your guide will greet you and transfer by private car through the city to your hotel for check-in. Rest of the day is easy and rest. Overnight in Ho Chi Minh City. Depart Ho Chi Minh City at 0800 in the morning for the drive to Cu Chi district. Arrive and start the visit of the famous Cu Chi Tunnels which consist of an incredible underground tunnel network constructed by Vietnamese resistance fighters (Viet Cong) during both the French and American wars. Start the visit with the Ben Dinh or Ben Duoc sections of the tunnel. Here you can imagine what it was like to be a guerrilla complete with Russian Carbine rifles and AK 47’s. After lunch, Head back into the center of the city visit the War Remnants or History Museum and take a glaze at the former Presidential Palace, from there to the major sights of colonial Ho Chi Minh City: the Old Ho Chi Minh City Post Office, Dong Khoi Street (formerly Rue Catinat), Continental Hotel, Opera House and City Hall. Overnight in Ho Chi Minh City. Buffet breakfast in the restaurant then take a walking or cycling tour around the island. Go to one of the orchard, free fruits picking of mango, rambutan, longan…Boat transfer to Cai be harbor take bus back to Ho Chi Minh city. Transfer to Tan Son Nhat Airport for the short flight to the central port city of Danang after breakfast. On arrival in Danang drive 40-minutes to Hoi An. Take a walking tour of the ancient town centre to visit former merchants’ houses, the 400 year-old Japanese Covered Bridge, a Chinese communal hall and the colorful market. Overnight in Hoi An. Start your day at Thien Mu Pagoda, one of Hue’s most iconic landmarks. Constructed in 1601, a 21-meter tower is the centrepiece of the pagoda. Then continue to the Mausoleum of Tu Duc, built decades before its occupant's death the tomb was used as a palace retreat before the emperors resting place. Finish up the morning at Khai Dinh’s Tomb which is traditional Vietnamese in design with a European touch making it unique from the other tombs in Hue. In the afternoon transfer to the air port for the short flight to Hanoi. On arrival transfer to your hotel and the remainder of the day is at your leisure. Overnight in Hanoi. This morning join a special cooking class. Start with a visit to a local market accompanied by a chef; here you’ll get a chance to learn about Vietnamese ingredients and cuisine. A cooking demonstration follows and you’ll have the opportunity to play an active part. After the class lunch is served so you can sample all the different dishes prepared during the demonstration. In the after noon, visit Temple of Literature, Vietnam’s first university. The tour continues with a visit to one of the following museum that you have to decide to pick the one you like (the Ethnology Museum, Army Museum, National Fine Arts Museum, Hanoi Hilton prison or Vietnam Women Museum), then a short walk around the Old Quarter and enjoy water puppet show. We depart Hanoi at 08:30 and head west towards Hoa Binh city with a visit to Vanphuc silk village on the way, we drive towards Mai Chau valley, about another two hours away to White Thai village of Poomcong. Enjoy the stunning views while lunching on tasty local dishes cooked by the White Thai girls of the village. – after lunch spend the afternoon exploring the idyllic natural surroundings we walk to Van village which is surrounded by spectacular karst rock formations and rice paddies village . Our hosts for this evening will be the White Thai minority people. In sampling these peoples hospitality, we find out a little more of their lives and cultures with a cultural exchange following the evening meal. This evening you have chance to enjoy the local dance and music (optional)Tonight’s accommodation will probably be a little more rustic than you would be used to. Following breakfast we embark on a lovely walk to Lac village before your departure to Ky Son village, as you arrive at the top of the Mai Chau Valley itself, don't forget to have your camera ready as the views are superb. Arrive in Ky Son, enjoy welcome drink with local fresh green tea. After lunch, take a bicycle ride to discover the Ky Son, Tam Son and Van Minh farming communities. Stop at any home you like for a cup of tea. Chat with local people about their daily life and farming. You can help with plowing or making rice beds, transplanting seedlings, harvesting rice (or cassava, corn, sweet potatoes...) depending on the harvest season, collecting tea and all medicinal herbs needed for your steam bath late this afternoon and foot “spa” late evening. Dinner then have a foot bath of warm water with ginger, salt and mugwort medicinal herbs before bedtime. Coffee and joining Yijinjing traditional exercises, praying Buddha, observe the morning worship and participate in burning false money and gold for the deceased. After breakfast, take a bicycle ride through ritual paths with local guide to discover the Cam Cao village, Mia pagoda, Duong Lam ancient village and Ngo Quyen tomb. Return to the house and relax. Lunch then drive back to Hanoi. Overnight in Hanoi. On your return to Halong City enjoy a wholesome brunch as your boat weaves through strange-shaped limestone rock formations. Upon disembarkation your driver will meet you for the transfer to Hanoi airport for your flight to Luangprabang. Picked up in Luangpranbang and transfer to hotel & get ready for your visit next days. After breakfast, transfer to the airport for your flight to Siem Reap. Arrival in Siem Reap and transfer to the hotel for check in, in the afternoon we will to visit the floating village of Chong Khneas, located 10 kilometers south of Siem Reap where you can find schools, restaurants, hospitals and much more on the great lake of Tonle Sap. We take a boat trip in a traditional wooden boat on the Tonle Sap Lake, the "Great Lake" of Cambodia, one of the largest in Asia. And continue to visit to "Les Artisans d'Angkor - Chantiers Ecoles" of Siem Reap and spend time at leisure at a local market. Overnight in Siem Reap. Early morning, we will visit the sunrise at Angkor Area – the idea is to view the reflection of amazing Angkor temple in the morning sun. Return to the hotel for breakfast. After that, Morning we will visit the enchanting Banteay Srei. It appears that the temple was designed to leave no space undecorated, and the fine carvings in pink sandstone are unique. We will continue after by car to a little chain of hills. After one hour, we will arrive in a place near Kbal Spien and continue our journey on foot, following a white sand path which heads up into the jungle. This very pleasant walk takes us through the beautiful forest. Please note that there are several narrow and steep passages on the way. After approximately 40 minutes walk, we will hear the sound of a waterfall. We will discover that the riverbed and the rocks around us are covered with carvings representing the gods of the Brahma religion dating back as far as the 11th century; it’s the "thousand Lingas Rivers". The water runs over the sculptures of Vishnu, Lakshmi, Hanuman, Rama and many Lingas, which were carved in stone in the past to sanctify the water and to thank the gods for their gift. 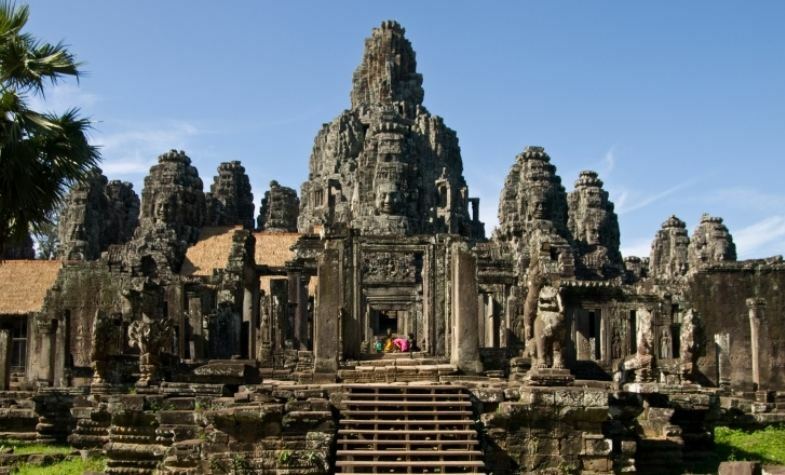 After this visit, we will go to Banteay Samre, with elaborate architecture and exceptional carvings, and we will visit of a local village. Overnight in Siem Reap. Breakfast at the hotel and transfer to the airport for flight to Phnom Penh, arrival in Phnom Penh and transfer to the hotel for check in, in the afternoon we will to visit the Royal Palace, built by King Norodom in 1866 on the site of the old town, and the Silver Pagoda. Located within the grounds of the Royal Palace, the Silver Pagoda is so named because of its floor, which is made up of 5000 silver tiles. The treasures found inside include a solid gold Buddha encrusted and weighing 90kilograms and a small 17th century emerald and baccarat crystal Buddha. and visit of the Wat Phnom Temple, Phnom Penh's namesake, from where you can enjoy views over the tree-lined avenues of Phnom Penh during sunset. Overnight in Phnom Penh. After breakfast at the hotel, we will continue our visit the Toul Sleng Prison Museum and the Killing Fields of Choeung Ek-both grim reminders of Cambodia's bloody past under Pol Pot. It is almost inconceivable to confront the nature of true evil here in this gentle land, but the Buddhist memorial at Choeung Ek, commemorates the 1.7 million victims of the 1975-79 Pol Pot regime. This excursion may prove distressing for some. It is, however, an important piece of this country’s historical and cultural puzzle. Then we discover Phnom Penh’s Psar Toul Tom Pong, known as the Russian Market, a great place to hunt for souvenirs, curios, and silks...After noon transfer to the airport for your flight home. Safe travel!